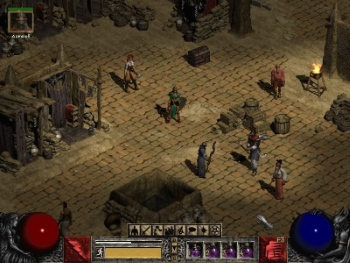 Download a free demo version of the classic game Diablo 2. Diablo II wakes up some memories for most. The game was released back in 2000 and was extremely popular with computer players. The reason for the popularity is because the game was a continuation of the Successful Diablo, also called Diablo 1. Both Diablo I and Diablo III were extremely well-developed action role-playing game, Hack 'n' Slash game. In addition, the games have an incredibly exciting and catchy story behind them, and it seems that one's actions are important to the world around one. Diablo II can be downloaded in a demo version for free here. The game is designed for Windows, so if you are using Mac, unfortunately you can not join this game. How could it be that the Diablo series has, and had such great Success among computer players? Firstly, the Diablo series is incredibly well-developed and whatever role you take to you, you will soon be absorbed by the amazing world. Which leads to the second reason for Success. Diablo tries to destroy the world, but before you meet him, you must fight through all his hand strings and try to improve your skills as well as your armor and of course your weapons. In order to get through Diablo II, you go through a number of Villains and their subjects. The Villains are usually other forms of demons, and their subjects can be anything from skeletons to scary giant bats. When you defeat the various Villains and subjects, there is a chance that they throw gold, weapons, armor, etc. The gold can be used to repair your existing armor, buy elixirs - or buy for better weapons or armor. The different weapons make you hurt more and armor makes you take less damage. The above is an example of a character who has collected a weapon. The weapon is later in one's inventory, and in that you can read about whether the weapon is an improvement on your current and what requirements must be met before you can use the weapon. The higher you have set the difficulty in the game, the better weapons and armor you can get by defeating the Villains. It may therefore be advantageous to defeat the first and a little easier villain at a higher difficulty if you find it difficult to defeat the next. As you can see, the bad guys vary considerably, but how to deal with the various Villains is also different. Some of them are relatively easy to grab while others require strategy and planning to defeat them. You may need to collect a group, but you can also use online tutorial videos if you get stuck. However, you can always always lower the difficulty. After download and installation, you must create your own character before you can start playing. Amazon uses primarily spear or arch. Your attacks have a touch of cold and fire when you attack the enemy. The barbarian is the classic warrior, and primarily uses either large weapons, or smaller weapons supplemented with a shield. Paladin is a sanctuary that primarily uses smaller weapons supplemented with a shield. Paladin can throw the light on his weapon, thereby causing greater damage to the enemy. Also throws magic, but does not wake the dead alive. On the other hand, she mainly uses fire, cold and lightning for her magical powers. The above characters are those included in the standard version of Diablo II. There is therefore the possibility to play two additional characters: Druid and Assassin, but these characters require the expansion pack of the game. As it is a demo version of Diablo II, which you can download here, unfortunately you can only start playing the Barbarian character as the others are locked. To play the others you have to buy the full version of the game. Diablo II is a fantastic fantasy game that offers exciting and challenging enemies. Despite the fact that the game was released back in 2000, it is still incredibly entertaining and has survived the years quite well. It's a bit confusing to get into the game at first glance, but we guarantee you will not regret if you try it. The game is incredibly profound and there are many things to learn, but once learned, there are hours of entertainment ready for you. Diablo II is a childhood memory for many, and the game is as fun as when we were less. Even though you did not play Diablo II as a child, you can still enjoy it. Diablo II was therefore a warm recommendation of us. Find Diablo 2, mark it and choose "Uninstall"
Should Diablo 2 has been damaged or corrupted and thereby difficult to remove we can recommend you finding help to uninstall it here.